I've set up a Github repo with some of my defaults for Fusion. Im a long time Nuke/Fusion user who were looking to customize Fusion to mimic/be inspired by Nuke. Especially if you're a Nuke user and are having a bit of trouble adjusting to new layouts, hotkeys and node names. I've provided a lot (but not all) of the most common Nuke hotkeys, Nuke screen layouts and Nuke nodes. So when you hit that TAB looking for Nuke's Reconcile3d in Fusion, you'll actually get the equivalent of Fusion's; which is Locator3D. Hopefully this will help some Nuke users in picking up Fusion for production work. Feel free to contribute, clone, tear appart and abuse the repo. Great work Alan. Having been a NukeX user for a few years, I spent some good time not too long ago remapping Fusion hot keys to work like NukeX. Your contribution takes it to a whole new level and I really appreciate your effort. Thanks! Wow! It looks pretty amazing, will check it out later. Thanks! Excellent work. Was thinking about doing something similar myself though only with the hot keys. Its fairly basic, but it got me up and running pretty quickly. Hopefully it might be useful for others too. i just started with fusion this week after having used nuke for so long and the timing couldn't have been more appropriate. Does anyone have ideas how one could change the 3d navigation style to something more practical in todays graphics world. Knowing that fusion was once bundled with 3d maya software I can't believe that they didn't adapt at least their ALT navigation which makes more sense. Hey Peter, don't know how to change the navigation keys unfortunatley. However, I've found that I can do all my navigation with just the pen without needing a keyboard with the defaults in Fu. Really nice once you get used to it. 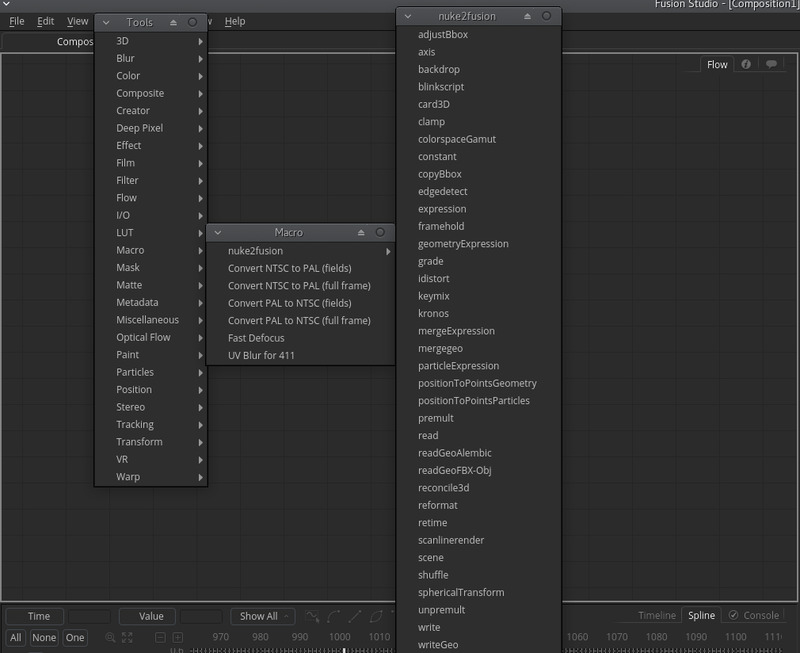 Also, uploaded a bunch of new "nuke nodes" in the macro repo for nuke2fusion. And changed some hotkeys to match nuke better. Pete Kober wrote: Does anyone have ideas how one could change the 3d navigation style to something more practical in todays graphics world. Knowing that fusion was once bundled with 3d maya software I can't believe that they didn't adapt at least their ALT navigation which makes more sense. This. Im a little used to the current controls now, but i think this is still one of the most requested features. I'm thinking about switching but curious what the Fusion learning curve is coming from Nuke? And seriously Blackmagic, about that dongle, if someone is going to pirate $299 software, you're probably not losing a sale anyway. I know we can manualy change tool color via GUI one by one. flow in fusion with a bit dull and hard to find your tool unlike Nuke where they color code a bunch of node to certain color. which make it easy to read and find what you're looking for. once you know how to operate Nuke, Fusion learning curve should not be much of a trouble. Tanawat Wattanachinda wrote: Thanks for making this. I made something like that and I can share it with you. I have attached my master "nuke node colors" comp that shows all the colors I changed. Also, and most importantly, here's the .zip file that contains the settings for the custom tool colors. Put them into your /Fusion/Defaults folder. For some reason, the nuke2fusion macros do not inherit these color settings . This might be a limitation of Fusion and/or part of a more complex issue. However, if you select the tools normally, the colors work 100%. Please try it out and let me know what you think. Keep in my that I set "Path Map" in preferences to "/home/tor/Documents/BlackmagicDesign/Fusion/nuke2fusion-master/nuke2fusion/;AllData:;Fusion:"
alan bovine could you please put this into nuke2fusion? Are you saying that the colored tools work with the nuke2fusion macros? For example, if you call up the tool menu and type "reformat" and select "reformat(Macro)" you get the purple "Resize" tool in your comp? If so, could you explain your process in a little more detail as to how you achieved it? You said you changed your Path Map in the preferences but there's many different paths for things so I was wondering which specific one you changed. User Paths? As far as i've found out; you can change the colors of the nodes globally regardless by hacking at the fusion.fuskin file (which is just a zip file btw) . There's two config files in there that lets you change the appearence for any node. Granted this isn't as portable as doing it with user colors on macros. There are ways to script it, but to me that defeats the purpose. The idea behind nuke2fusion is to get users acustom to the fusion equevalent by showing the relevant nodes. alan bovine wrote: As far as i've found out; you can change the colors of the nodes globally regardless by hacking at the fusion.fuskin file (which is just a zip file btw) . There's two config files in there that lets you change the appearence for any node. Granted this isn't as portable as doing it with user colors on macros. Updated the hotkeys config file with support for two scripts that tries to automatically connect nodes via merges. A 2d merge will connect the two first selected nodes while a 3d merge will connect all selected 3d nodes to a single merge. This puts the merge in the center of all the selections. Have a look at the Scripts/Utility/* folder and the updated fusion.fu config file. These are bound to the hotkeys m and M. Lowercase m for 2d and uppercase M for 3d. Thanks for the nuke2fusion tool. It is possible that when installing it, the possibility of doing alt + click has been lost? The only way to select only the underlay node (Backdrop in Nuke) and be able to rename it or select it by itself, is with alt + click, but I can not do it anymore. If it were because of nuke2fusion ... would there be a chance to recover it?